A misty smell arose and a sense of serenity came over me. As I stood underneath the tree, I felt a chillness descend. Nearby a mound of snow began to blend with dirt. It was raining. I became captivated by the sounds of tiny drops, and ran to the porch before the downpour began. As I watched the gray clouds roll in I relaxed, rain has a calming affect over me. Studying the tranquility of the afternoon, I observed birds finding shelter, and squirrels looking for cover. A steady downpour began. A cool breeze blew through the trees. Little puddles began to form on the sidewalk and in the street. All the while I stood fascinated by the scenery being fashioned before my eyes. Most people find a heavy shower troublesome. While I observe nature, as a composer of a beautiful song. Walking about the porch I find different sources from which the rain makes its appearance. There are plants in pots being soothed by drips. In an empty bowl the sound is of peas on a drum snare. On the roof chimes clatter as if diamonds were falling. Windshield wipers kept a syncopated time, and scurrying feet added another beat to the stage. Stretching onto a lawn chair, I take a deep breath. The smell of wet grass surface as an odor of wet soil and pine needles arise. Children are jumping into puddles. At the same time car occupants are running into dwelling places. Another breeze sets in, as thunder and lightning sound in the distance. As little droplets of rain shatter onto the pavement. A shiver is felt down the spine. The atmosphere is either cool or humid. It feels tingly and enticing. Leaving the skin moist or clammy, after it has been dried by the wind. Evening appears and darkness begins to envelope the streets. The rain becomes peaceful. 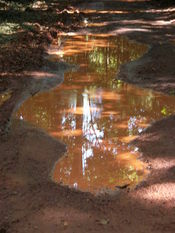 A stream of water flows down the driveway. The trees come to a stand still and there is a sound of nothing. Then sounds of a babbling brook evolve. A mist settles in over the lawn, and the street lamps are fogged. Flashes of lightning appear, and once again the rainfall keeps a rhythmic pattern. Even as commotion goes on, the pitter-patter sound rocks me to sleep. WriteWork contributors. "Rain" WriteWork.com. WriteWork.com, 24 June, 2001. Web. 25 Apr. 2019.